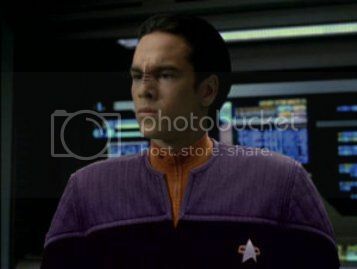 He was young and inexperienced; as a result, fellow Maquis resistance fighter Kenneth Dalby was very protective of Gerron during their time on Voyager. Gerron was reticent, to the point of rudeness and, as a result, was ordered by Commander Chakotay along with three other former Maquis members, Chell, Mariah Henley and Dalby, to undergo a rigorous Starfleet Academy-style training scenario conducted by Lieutenant Tuvok and aimed at bringing former Maquis personnel unfamiliar with Starfleet standards and in dire need of some discipline up to date. During one of the exercises he was almost killed by a plasma leak but was rescued by Tuvok and the rest of the team. After Voyager returned home Gerron expressed interest in remaining in starfleet. Chakotay made the man an Ensign and he was transferred to the operations department to serve under Harry Kim.